OTL Blog » Blog Archive » “Critical Report from the World Fringe Congress” to hit Europe’s Fringes! “Critical Report from the World Fringe Congress” to hit Europe’s Fringes! When infringement festival founder Donovan King was invited to the first-ever World Fringe Congress in Edinburgh, Scotland, he thought there had been a mistake! After being kicked out of the Montreal Fringe Festival in 2001 for criticizing a corporate sponsor, King has made a point of crusading to protect Fringe Festivals from excessive corporate interference in order to empower artists and safeguard the indy arts event. 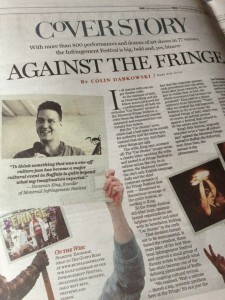 When the businesspeople representing Canadian Fringe trademark holders refused to listen to the concerns of Fringe artists and other stakeholders, King responded by creating the infringement festival. The 2012 World Fringe Congress had over 50 so-called “Fringe” Festivals in attendance, including some with heavy corporate ties. The infringement provided a critical look at how cultural history is repeating itself. As the original Fringe gets co-opted and loses its edge, artists are fuming that their theatrical playground has been compromised and is no longer affordable or inclusive. 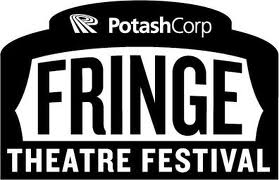 Even more worrisome are rumours that Edinburgh Fringe could soon be renamed the “Pepsi Fringe”, following the lead of festivals such as PotashCorp Fringe (originally the Saskatoon Fringe). Come to the show and learn about the controversial history of the Fringe and infringement festivals and pressing cultural issues in this critical and theatrical report! Observe that King is legally unable to do this performance at Fringe Festivals in Canada due to corporate trademark issues. 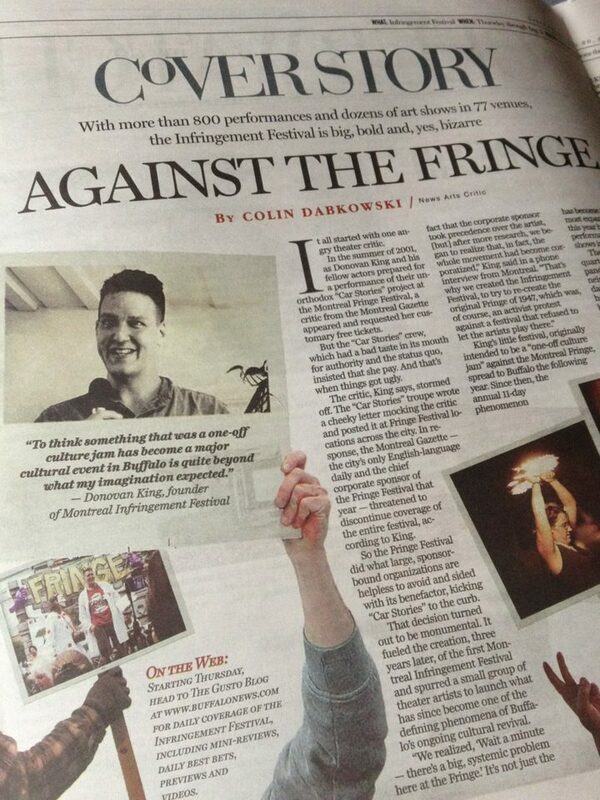 Discover ways how to safeguard your Fringe Festival from corporate manipulation! You also can read the written report and send your concerns with King to the 2nd World Fringe Congress, running August 15 – 17, to which he has been invited in August, 2014! Lastly, this performance has been adapted as a POP-UP-SHOW, meaning it can be performed anywhere at any time for any number of people. The tech requirement includes only a powerpoint presentation, and that can be done off a laptop if there is no projector and screen available. To book the show, simply ask Donovan King in person or email him at optatif@gmail.com to make arrangements. The show is 45 minutes and Mr. King graciously accepts any donations to help fund the Montreal infringement Festival. This entry was posted on Wednesday, August 6th, 2014 at 9:43 am	and is filed under Activism, Performance, Road Trips, Viral theatre. You can follow any responses to this entry through the RSS 2.0 feed. You can leave a response, or trackback from your own site. A Call to Action to Help Update the Education and Tourism Systems in Tiotà:ke / Montreal! CityNews TV interview with tour guide Donovan King, November 3, 2018. CBC Radio One – Daybreak with Mike Finnerty. Interview with Donovan King of Haunted Montreal. November 2, 2018.